According to a new intelligence assessment shared with both Congress and key U.S. allies around the world, Syrian President Bashar al-Assad has used chemical gas on his own people, killing as many as 150 Syrians. 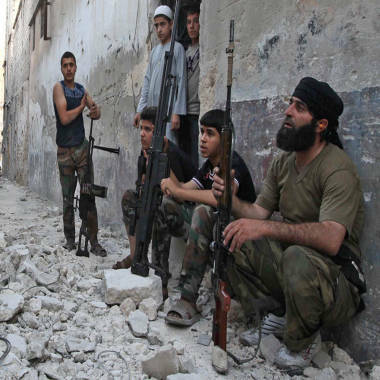 Since then, the White House has been quietly ramping up support for the Syrian opposition. NBC's Chuck Todd reports. The United States and its allies have concluded that the government of Bashar Assad has used chemical weapons in Syria's protracted civil war, leading President Barack Obama to broaden aid — including military support — to opposition groups. The intelligence community concluded with "high confidence" that the Assad regime had used chemical weapons — including the nerve agent sarin — "on a small scale against the opposition multiple times in the last year." "The intelligence community estimates that 100 to 150 people have died from detected chemical weapons attacks in Syria to date; however, casualty data is likely incomplete," said Deputy National Security Advisor for Strategic Communications Ben Rhodes. The use of chemical weapons crosses the so-called "red line" first established by Obama last year, which he said would prompt the administration to alter its posture. The administration said on Thursday that Obama had decided to broaden support to the Supreme Military Council, a principal opposition group in Syria, and Rhodes said that assistance "will include military support." Rhodes declined to specify what kind of military support the United States would provide to the SMC, but noted that Obama had not decided to establish a no-fly zone, as some Republicans have demanded. Rhodes cited the "great and open-ended cost" associated with establishing a partial or complete no-fly zone over Syria, seeming to suggest that the prospect of such action, for now, was unlikely. He added: "We're looking at a wide range of types of support we can provide both to the political opposition and to the SMC on the ground. I'm not going to be able to detail every single type of support that we are providing, but it's suffice to say it's important to note that it is both the political and the military opposition that will be -- that is and will be receiving U.S. assistance." A look back at the conflict that has overtaken the country. Reuters reported that Obama administration officials have said that any arming of the rebels would likely be limited to small arms and ammunition rather than anti-aircraft weapons. Obama first laid out his "red line" in August. "We have been very clear to the Assad regime, but also to other players on the ground, that a red line for us is we start seeing a whole bunch of chemical weapons moving around or being utilized," Obama told reporters at that time. "That would change my calculus. That would change my equation." The president noted earlier this year that there had been preliminary indications of the use of chemical weapons in Syria. But he resisted taking action until he said the intelligence community could conclude with certainty that such weapons had actually been used by Assad. To that end, Rhodes said that the United States and its allies had begun acting in April to assist the SMC by providing increased support in response to Assad crossing a "red line." But Rhodes also noted that the United States had prepared for "multiple contingencies" — military, diplomatic, or economic — to help put pressure on the Assad government. Conflict between Sunni and Shia communities in Syria has now moved beyond its borders, polarizing countries across the Middle East. Channel 4 Europe's Lindsay Hilsum reports. "We're going to make decisions about further actions on our own timeline," he said, later adding: "We're looking at a wide range of types of support we could provide." The topic of Syria is sure to loom large next week as the leaders of the world's largest economies gather for the G8 conference in Ireland. The Obama administration had come under pressure from hawkish Republicans in Congress to take a more active role in ousting the Assad regime, either by directly arming rebels, or by enforcing a partial or complete no-fly zone in Syria. “I applaud the president’s decision and I appreciate it," Sen. John McCain, R-Ariz., one such hawk, said Thursday on the Senate floor. "But the president of the United States had better understand that just supplying weapons is not going to change the equation on the ground [or] the balance of power. These people – the Free Syrian Army – need weapons, heavy weapons to counter tanks and aircraft, they need a no-fly zone, and Bashar Assad’s air assets have to be taken out and neutralized. We can do that without risking a single American airplane." Said Brendan Buck, a spokesman for House Speaker John Boehner, R-Ohio: "It is long past time to bring the Assad regime's bloodshed in Syria to an end. As President Obama examines his options, it is our hope he will properly consult with Congress before taking any action." It’s not just Republicans who have directly or indirectly put pressure on the president for more action. Former President Bill Clinton reportedly told McCain in a closed-press event Wednesday that he agreed with the Arizona senator about the need for Obama to act more forcefully to support Syrian rebels, saying Americans expect their presidents to be able to “see down the road” and set aside public opinion. 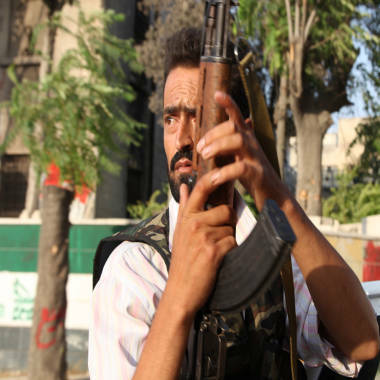 People resisting the army of President Bashar al-Assad in northern Syria cope with loss and prepare for fighting. But there are delicate considerations involved in the administration's decision to become more involved. Namely, the U.S. is worried about navigating a thorny relationship with Russia, which has been resistant to apply much pressure to the Assad regime. Some U.S. officials have also expressed concern that arms supplied to rebels could fall into the hands of fighters who could eventually pivot to use those very arms against U.S. interests or allies. And then there is the issue of scarce political appetite among most Americans for increased military involvement in Syria following more than a decade of war in Afghanistan and Iraq. Just 15 percent of Americans said in June's NBC News/Wall Street Journal poll that they favor U.S. military action in Syria; only 11 percent want to provide arms to the opposition. A plurality of respondents -- 42 percent -- prefer to provide only humanitarian assistance, and 24 percent believe the U.S. shouldn't take any action. NBC's Mark Murray and Carrie Dann and Reuters contributed to this report.